Few devices have ever been hyped to the extent of the iPhone. And the extra year and a bit of waiting between when it debuted in the U.S. and when you can officially buy it in Australia have made the hype storm all the more intense. It’s hard to believe any device can live up to such expectation. So does it? The device that will go on sale on July 11 is a somewhat improved version of the device that went on sale in the U.S. last year. For one thing, it has a 3G chipset that enables it to use fast mobile data networks when available. For another, it has real GPS, rather than the pretend GPS that the old iPhone and iPod touch can use, which fakes your position based on nearby mobile phone towers. Also, it has a plastic back instead of a chrome back, making it less like an iPod touch and more like a phone. All of which is very relevant to you if you’ve used a first-generation iPhone and therefore have something to compare to. If, like most of us, you haven’t, read on. I’ve been using a 3G iPhone for a few weeks now, and my impressions follow. Note that I was able to use it with the Optus and Vodafone networks, but had not had sufficient time using it on the Telstra NextG network before writing this, so I’ll leave that for a follow-up, hopefully next week. 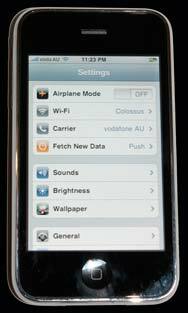 Note also that services such as MobileMe and the App Store, which add key functionality to the iPhone 3G, had not been launched before this was written so I did not have an opportunity to test them. There’s a reason Apple didn’t call this device the “iPod phone” or similar. It is, first and foremost, a telephone. And it’s a good one. I had a great deal of difficulty finding anywhere where I couldn’t get at least some reception. Even seven levels underground in a parking-lot elevator, I could make and receive phone calls. That’s pretty impressive. What’s more, the iPhone squeezes the most out of whatever limited signal it can get, so even those deep underground phone calls sounded clear. Tapping the Phone icon on the touch screen brings up a large standard-format alphanumeric keypad, so you can dial numbers like 133-MAC (you can’t do that on the BlackBerry’s QWERTY keyboard). Once you’ve dialed, another screen comes up with options to put the call on speaker, mute, hold, add another call or pop out to your Contacts list. The Contacts list is synced with your OS X Address Book (which makes one wonder why it isn’t called Address Book, but I digress) and, at a touch, you can dial a phone number, send an SMS or an e-mail to anyone in the list. The Settings screen lets you configure many of iPhone's functions, but not as many as you might like. One thing I like about the BlackBerry 8300 as a phone is the ease with which you can get at your favorites. On the 8300’s keyboard, you can assign any key to a number in your address book. Effectively 26 favorite numbers, accessible with a single keystroke. The favorites list on the iPhone isn’t quite that clever, but without a physical QWERTY keyboard how could it be? Instead, you click the Home button (the only physical button on the front of the iPhone) twice, and up comes your Favorites list. Only eight favorites are displayed at a time, but scrolling through is a flick of a finger, and you can have more than 26 if you need to. To call one, just tap. So the iPhone isn’t the best at handling fast access to favorite numbers, but I’d put it a close second. The speaker is also good and loud, so it’s very effective for times when you want to chat without holding onto the phone. And unlike with the BlackBerry, people I spoke to over the speakerphone sometimes couldn’t tell I was on speaker. The other thing the iPhone is noted for is access to the Internet wherever you happen to be. The addition of 3G makes that an even more attractive proposition, at least if you happen to be in a 3G area. More on that in a bit. The iPhone comes with a mobile version of Safari pre-installed. It’s unclear at this point whether or not Apple (which as the operator of the App Store has final say over which applications get distributed) will allow another developer to release a web browser for the iPhone. As a Camino user myself, I hope it will. However, even the web browser pre-installed on the iPhone is far superior to any web browser I have ever used on any mobile device. With most mobile devices, even fairly good ones such as the BlackBerry 8300, I’ve hesitated before breaking out the web browser. Speed and usability have just generally been that poor. Not on the iPhone. The big, bright screen and simple interaction with the touch interface make it much easier to interact with than other mobile browsers. The touch interface makes the difference here. Using a scroll wheel or a little ball or even a stylus to work your way around a web site just doesn’t work as intuitively as grabbing, sliding and tapping. As well as the web browser, the iPhone comes pre-installed with a number of other applications that make use of mobile data. A Weather widget allows you to look up the weather in any number of cities around the world if you need that kind of thing, and a Stocks widget keeps you up to date with your portfolio (including Australian stocks). Interestingly, I couldn’t get the Weather widget to update when using the Optus 3G network. It was fine with Vodafone or WiFi. This may be a pre-release glitch. And of course there’s YouTube. If you thought YouTube ate too much of your time when you’re at your desk, just wait until it’s something you can waste time with on your way to work. Searching for videos is easy, downloading over 3G is surprisingly quick, and anything halfway decently encoded looks great on the wide screen. Before you buy an iPhone, be sure that you’re happy with the mobile data component of the plan you’re on. Unlike with other phones, you will use it. Unfortunately, unlike my BlackBerry, the Sony Ericsson Z600 that preceded it or the Nokia 6210 that preceded that one, the iPhone can’t be used as a modem connected via Bluetooth. This presumably is a nod to telcos that are also ISPs such as Telstra and Optus, so people can’t use their iPhone’s data connection for “real” browsing. But it’s very unfortunate. It’s not a feature I use a lot, but it’s handy to have when I need it. The iPhone’s Bluetooth connection is presumably just there to connect headsets and the like, which it does smoothly and works well (I used a Plantronics headset with no problems). I’m treating e-mail separately to other internet applications, because I think this is an area that needs particular attention. At the moment the king of mobile e-mail is RIM with its BlackBerry platform. The BlackBerry, it’s fair to say, is an e-mail device that’s had other functionality tacked on the back for good measure. It could similarly be argued that the iPhone’s e-mail functionality feels a little bit tacked on. On the BlackBerry, you have your choice of seeing all your messages from all your accounts (plus SMS) in one big inbox, or having them separated out into separate lists. If you choose the latter, you can go straight to each separate inbox from its own icon on the main screen. On the iPhone, however, you have to have all your accounts separate, and you access them by clicking on the Mail icon on the main screen. Clicking on that brings up the various different accounts, and you tap the account you want and then tap “Inbox” to see your new messages—three clicks to achieve what you can do on the BlackBerry in one. For a company that prides itself on user interface design, this is a problem. Of course it’s no problem at all if you only have one e-mail account, so let’s move on. When reading a message, you have five icons at the bottom of the screen: a circular arrow for “refresh” (useful if an e-mail is taking a while to load); a folder with an arrow on it for “move to a new folder”; a trash can; an arrow pointing up and to the left, universally understood to mean “reply”; and a square with a line in it, which means “compose a new message”. The “move to a new folder” option is only useful if you have an IMAP account and you’ve created folders using your desktop computer. There’s no way to create new folders using the iPhone. Or at least none that I could find. If you have a POP account, you have the Inbox, Sent Items and Trash. And that’s it. You may notice that I didn’t list an icon there for forwarding a message. I puzzled over that one, until I discovered that tapping the “reply” icon gives three options: Reply, Reply All and Forward. It’s not quite of the order of clicking Start to shut down, but it’s getting there. I mention the placement of the “compose new message” icon because in the e-mail application it’s in the lower right corner of the screen. In the SMS application it’s in the upper right corner of the screen. In the e-mail application the upper-right corner of the screen is either arrows for moving between messages or, if you’re in a list view, it’s the “Edit” button for deleting or moving messages en masse. Having the “compose” function in one app in the identical location to where one finds the “delete” function in another app seems a bit un-Apple to me. The ability to delete and move emails en masse is reportedly a new feature of the iPhone e-mail client, but having never used the first one for any length of time I can’t comment on how difficult life must have been without it. I can tell you that an e-mail client that has no mechanism for marking a message as read without actually opening it (such as, for instance, the iPhone) is irritating. And then there’s notifications. The BlackBerry allows an incredible amount of customization in how you’re notified that you’ve received a message. For any given contact, you can specify a different (customizable) sound to play if they send an SMS or to each of your different e-mail accounts, as well as custom ringtones. Some might say the BlackBerry offers a bewildering array of options in that regard, but once you’re used to working with them it’s useful. iPhone, on the other hand, lets you set custom ringtones. And that’s it. You can choose from a set of pre-installed sounds for SMS notifications, but can’t add your own. And for receiving mail you’re restricted to one sound and one sound only. You can turn it off if you want. I could go on, but I won’t. The short story is that if Apple wants to compete with RIM for the e-mail power-user market it needs to do a lot better than this. Or if it can’t it should let someone else develop a proper e-mail client for the iPhone. You may be aware that Apple manufactures a very popular portable media player, and the functionality of that media player is incorporated into the iPhone. At 8GB and 16GB capacities, it’s a fairly limited iPod (compared to, say, 160GB on the $449 iPod classic) so unless your multimedia demands are fairly modest it probably won’t replace your primary iPod. Which is a pity, since one of the cool promises of the device is rolling the two mobile doodads (phone and iPod) that people walk around with into one. One thing the iPhone can do that the iPod touch can’t is play music without headphones plugged in. It’s got speakers, so why not? The sound quality isn’t great, but it can do it. One thing the iPhone (and iPod touch) can’t do that certain other iPods can is record audio. 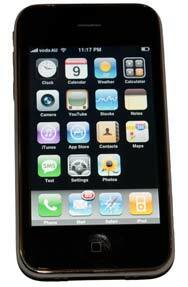 Many people (such as journalists) have taken to using iPods as voice recorders and note takers, and the iPhone fails to replace that function. Apparently this is because of a different “handshake” procedure required by the iPhone and iPod touch compared to previous models. So it’s a matter of someone making a compatible microphone. Like any other iPod, you sync your data with the iPhone via iTunes. Using iTunes you can copy your Address Book, iCal calendars and synchronize Mail folders (presuming you use Apple’s Mail) between iPhone and your Mac. Unlike any other iPod though, the data is actually useful to have on an iPhone. And when it’s available you’ll also be able to download applications from the App Store using iTunes and install them on the iPhone. One slight annoyance is that if you’ve taken any pictures using the iPhone’s camera, iPhoto launches as well as iTunes when you plug in the iPhone. It may be too much to ask, but given I can sync iPhoto libraries to iPhone via iTunes, it’d be a whole bunch more elegant to be able to go the other way as well. The iPhone is more than just a phone, an iPod, a mobile web browser and an e-mail client—it’s a unified whole made up of these parts. It’s that unity that sets it apart from other devices.